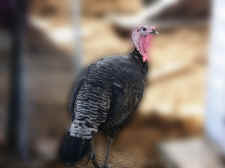 He was barely four months old, an adolescent turkey rescued from a small, "free-range" farm where the whole world, in its infinite richness and variety, was reduced to one warehouse filled to capacity with only one species -- 10,000 orphans of exactly the same age, size and color as himself. Nothing in his young, captive life had prepared him for this, this astonishing bounty of sights, sounds, and synergies that was now unfolding its riches all around him. He had no sound, no image, no dance, no instruction, and no inherited memory of the brilliant creatures who were now breathing, bristling, brimming with life all around him. Clarence stepped out of the rescue car incredulously, tentatively putting step before step, standing on one foot almost too long before putting the other one down carefully, gently, touching the ground below with infinite care, with an almost apologetic air in his pale person, as if treading not on solid ground but on the body of an exquisitely alive creature, a whale of a sleeping earth that could awaken at any moment. He advanced slowly, haltingly. After a few small steps, he stopped and stood there suspended on the pole of one long, pink leg, like a flamingo -- a feather cloud balancing his whole white downy weight on one lanky leg -- keeping the lean length of his other leg neatly folded against his chest, tucked away as in a marsupium, the better to nurture it for the journey ahead, curling his mutilated toes as in a question mark, furling them gently around the soft sole of a foot unaccustomed to walking. Or at least walking forward. He craned his neck, scanned the vast fields, the open sky, the yards, the barns, the pond, the bewildering richness of life that inhabited every inch of this improbable space, looking around briny-eyed, slack-jawed, before extending his folded leg and taking, as he had to, another small, slow, halting, tender-soled step forward. What was he to make of this improbable new world he found himself in? This world that, as far as his eyes could see, or his tender feet could carry him, was teeming with a bewildering diversity of strange and wondrous creatures the likes of whom he had never seen before -- hawks, quails, prairie dogs, foxes, snakes, lizards, mice, dung beetles and, closer still, gatherings of chickens, geese, ducks, goats, sheep, cows, pigs, dogs, cats, and, on the glaucous surface of the pond, the radiant vision of a swan! What was he to make of such a dazzling diversity of species, languages, individuals and histories, of this wealth of social interactions and relationships -- friendships, love affairs, lifelong partnerships, lifelong rivalries? Or of the way its native residents inhabited it -- freely, actively, creatively, passionately involved in their world, creating it, influencing it, changing it and, in the process, being changed by it, adding to the world's mind, substance, experience, knowledge and history with their own lives, making sweet or bitter sense out of the nectar and gall, the grit and the grain of their daily existence? Nothing in the unhistoried scabland Clarence had been rescued from provided a single clue how to be in the world, much less how to live in this world, how to inhabit its free, vast, open spaces, how to interact with individuals of other species and ages, or what to make of them in the first place. He had no memory of any of the most fundamental sentient experiences: the nurture of a mother, the sense and certainty of belonging to a family, a community, a place. To him and his fellow captives, Home was only an intense and inchoate yearning, not even a memory, but a massive lack, a gaping absence, a "constant, gnawing sense of having had and lost some infinite thing. That day and for many days to follow, Clarence walked around in a sort of languid daze, not so much exploring this fantastic new world as introducing himself to it, one slow, small, careful, step at a time, each step a signature of sorts, a salutation, a benediction on the living earth it kissed, an astonished breath, each new step, a new line in the living, happening, developing poem of his life. He moved around in a steady, tempered rhythm, an adagio of sorts, advancing with a quizzical air, with a touch of apology in his lanky person, as if looking for someone or something in everyone he met, and resuming his quest day after day with the same optimistic rose in his wattle, pacing the yards with something resembling devotion, like someone waiting, roses in hand, for a long lost lover in a train station. In those first few days, he ambled from barn to barn, from yard to yard, from roost to roost, with a dreamy, slightly alien air about him, advancing with such intense awareness, such deference, such restraint such politesse, gently, carefully treading among birds who barely came up to his knees, unfolding one long, lanky, languid leg at a time, craning his neck, pausing to ponder his next step before taking it with infinite caution, each step forward not so much an affirmation of self as a confirmation of his awareness of others, courteously, graciously ceding the way to the smallest, weakest birds, even when uncourteously asked to do so, and limning his astonishing, "listening" gaze on everyone he met. And yet, in the seemingly endless diversity of inhabitants, in the seemingly boundless expanse of land, under all that limitless sky, there was no one else like him. [Clarence was rescued shortly after Melvin, the last of the sanctuary turkeys, had had died of old age. So, in the weeks before his brothers arrived, Clarence was the only turkey at the sanctuary.] Not a single, solitary soul who looked like him, acted like him, or sounded like him. Not a single being who uttered his language or seem to understand it, no one who shared the physical and psychological grammar of his species. No one who could guide him through this astounding new world, at least not in ways that he understood as guidance, and no one who could wonder with him at its brilliance, at least not in ways that he understood as wonder. He was the only being of his kind in the new world. And, for four long weeks, a lifetime in the slow-motion time perception of adolescence, he was the only member of his species at the sanctuary, which is to say in the whole world. And then, on a crisp October morning, there they were, in the blue blink of an eye! Two tall, slender, stately birds like himself emerged from the rescue van and stepped out into the new world in a halo of white feathers. One walked forward with chutzpah and panache, as if he already knew every inch of this miraculous place, this improbable world that no soul of his doomed nation had ever seen or imagined, and was already qualified to guide anyone through it. There was not a hint of hesitation in his person as he took possession of his new life. Not a whiff of fear. Not a trace of shyness. He strutted into the new world as onto a stage, with a diva's assumption of universal adoration. Walter! Walter did not take steps, he gave steps, he issued steps, he expressed steps, each step, a statement, an exclamation, an exuberant expression of self, a performance of sorts-the first performance of his new life, the first of many to come. The other bird, smaller, weaker, shyer, teetered behind him, taking two steps forward, one step back, moving in a pattern of hesitancy, self-correction, self-doubt, self-erasure, second guessing, and missed beginnings, that would become his signature "indecision dance", each step a worry, a doubt, a premonition, torn between the desire to move forward and the need to stay put, stuck between the need to grow and the need to stay safe. It was the first act of indecision of Ian's new life, the first of many to come. Clarence ran towards them, his usual adagio rhythm quickened to an allegro, and welcomed them with a happy dance, fluttering his wings, tapping his feet, shaking his head and gurgling a joyful assortment of trills, gobbles, purrs and putt-putts. It was the first happy dance of his new life. The first of many to come. As Walter and Ian stood in the field outside the bird yard, trying to orient themselves in the new territory, Clarence started guiding them with his gaze, his body, his voice, eager to help them navigate their new home. They met his guidance with the kind of scattered response that would become the group's signature response: Ian froze in place, as if expecting an attack, and Walter started to jump and dodge as if answering an invitation to play. It was the flock's first act of discord. The first of many to come. The longer you knew them, the clearer it became that Clarence, Ian and Walter were not just different, they were incompatible. [Read Ian's Crossing here.] So much so that, in the context of their flock, and the culture generated within its dynamic boundaries, their deepest needs were impossible to fulfill. Ian, a reserved, retiring, sensitive fellow, could never get the nurture, the connection and the patience he needed from either of his brothers; Walter, a rowdy fellow who turned everything into a martial drama or a riotous game, could never get his brothers to engage in the kind of swagger and pageantry that affirmed (and confirmed) his identity; and Clarence, the obvious and uncontested leader of the flock, the largest, strongest, most confident and empathetic of the three, could not, in fact, exercise his authority because neither of his "subjects" heeded his signals: Walter was too independent to take directions, and Ian was too indecisive to follow. It was hard to understand what kept them together at all, why they insisted on sticking together through the myriad daily frustrations of living in a group that often thwarted their needs more than it fulfilled them, and whose demands divided them more often than it united them. 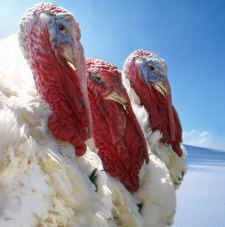 Beyond the superficial similarities of species, gender and age, Clarence, Walter and Ian had nothing in common and, with the exception of greeting visitors -- when they paraded in dazzling unison like great birds of peace -- almost everything else they attempted as a group was doomed to scatter into three separate directions. Each call to action was bound to result in three different actions, reactions, and outcomes. Each turkey was driven by such unique needs, fears and pleasures, and each perceived and responded to similar situations in such dissimilar ways, that getting all three to act together, as Clarence kept trying to do, was nearly impossible: Ian would freeze in place, torn between the urge to join and the need to hide, and Walter would turn every instruction, every assembly signal, every alarm call into a uproarious game, play-jumping, leap-frogging, ducking and dodging, and making imaginary fighting gestures. Yet they stuck together, Clarence, Ian and Walter, not as a family, or a team, much less a partnership, but as a sort of roaming, restless, rusty, creaky, bickering, disjointed Home on Six Legs -- not easy, not comfortable, not harmonious, but a home nonetheless, and the only home that beings like them can ever hope to find in this human-dominated world where they are bred for death and where, even if they are fortunate enough to be rescued, they live and die as perpetual exiles, forever severed from the ancestral world that formed their being, and forever torn from the communities whose history and culture anchored them in the world with a profound sense of meaning and purpose. They stuck together, bound on the surface by what was there -- species, gender, age, and perhaps the common memory of abuse and deprivation -- but bound at a deeper level by a sense of what was sorely missing, a sense of struggling always against the wrong shape of things, a sense of irretrievable, incommunicable loss. Yet, ultimately, if their connection was tenuous, it wasn't because they were so different, but because they were too fundamentally alike: souls without a place and a prayer in the world. Still, they had managed to establish a balance of sorts, a precarious balance, but a balance nonetheless. A union of sorts, an uneasy union, but a union nonetheless. Then Roscoe fell out of the dark sky of a frozen January morning and changed their lives forever. Roscoe, that black sun. He burst into their lives in the blink of an eye, in the snap of a heartbreak, and changed their course forever. It was just before noon when, amid the usual Sunday hustle and bustle of tours, visitors, volunteers, barn cleaning, and all manner of other friendly commotion, Clarence saw a long, lean, leggy black bird follow Chris into the sheep yard -- an adolescent wild turkey, no more than four or five months old, who was now eating out of Chris' hand, was climbing in Chris' lap, was softening to slumber under Chris' touch. Earlier that morning, Roscoe's flock had been scattered and killed by hunters and, when Chris found him, the young bird was still guarding the bloody remains of his last brother. No one was allowed to touch the lifeless body and nothing could get the embattled survivor to move away from it: he rejected food offerings, spurned friendly overtures, charged anyone who came near and, when, in a gesture of peace and submission, Chris sat on the ground, quietly hugging his knees, Roscoe pecked, pummeled and punched him with his bill and talons until he poured out his rage and sorrow to the last bitter drop. When he finally stopped, the back of Chris' jacket was nearly shredded, and the young wild turkey was exhausted. He stood there tall and still, yelping softly. Then he took a few weary steps around Chris and positioned his body squarely in front of him, inviting his gaze and making intense and inquisitive eye contact. What he gathered from the silent exchange seemed to reassure Roscoe because, a few minutes later, he calmly and deliberately followed Chris past the sanctuary gate, all the way to the sheep yard. He was about the same age as Clarence was when he began his life at the Sanctuary, but this young turkey was infinitely more confident, savvy, and at home in the world, either world -- that of the Sanctuary, or that of the wild prairie -- than Clarence and his brothers ever were or had a chance of becoming. Roscoe moved fluently, effortlessly between the two worlds and, if he followed Chris into the yard, if he ate ravenously from his hand, if he trusted him enough to sleep in his lap, and if later, he roosted in the high rafters of the bird barn, he did so with complete personal agency: Roscoe, and no one else (much less someone of another species), was in charge of Roscoe's life; Roscoe, and no one else, made the important decisions in Roscoe's life. And, whether he would choose to stay at the Sanctuary, or return to his wild country, that would be entirely his choice and his decision, too. But, on that bitter-cold January day, he was here, a stranger in Clarence's home, and, for the first time in his life, Clarence did not act with his usual courtesy, deference, and equanimity. He did not limn his sweet, listening gaze on this fine, free, rapturous creature. He did not introduce himself to Roscoe with his signature politesse, his elaborate ritual of overtures and self-effacements. He rejected Roscoe with shocking force and fury. His eyes blazed, his breath quickened, his chest swelled and heaved with red-clawed rage, his throat throbbed with a torrent of rabid invectives. And, for the first time in their lives together, his brothers followed his lead. They telescoped their necks to impossible lengths, they lifted on almost tiptoes as they paced up and down the fence, they issued urgent assembly calls, that become alarm calls, that became attack calls, and their soft feather halos become armors, and their wings become hatchets, and their bodies became weapons. They reddened their wattles, puffed up their chests, spiked their feathers, steeled their wings to daggers and dragged them on the ground as if carving blood boundaries, they stiffened their legs and strutted with the rigid gait of armored knights (and just as unsteady). They made themselves look bigger, tougher, stronger, invincible. Awesome. From a distance, their display could be mistaken for one of their extravagant greeting rituals that were reserved for guests, visitors and favorite volunteers. But Roscoe was no guest, their formidable parade was no greeting, and their loud staccato putts and coarse yelps were not a song of welcome. They confronted Roscoe in an amazing show of strength, stamina and solidarity-moving in perfect physical, emotional and spiritual sync, connected as in a war dance to an ancient inner music, acting in perfect unity of purpose and desire-not just to repel, but to frighten, for they knew being frightened, not just to worry, but to awe, for they knew being awed, not just to smite, but to shatter, for they knew being shattered, and they wanted more than anything, not just to protect their Home, but to affirm its existence, because they knew better than anyone, what it's like to have no home in the world, only the illusion of it created in the rickety space stitched together by the proximity of three incompatible individuals, and held together by the straws of necessity not nature, desperation not design. That day, and for many days to come, they went out of their way trying to not only expel the trespasser, but to break, bend, burn, wreck, scorch, smash, smite and shatter even the memory of him. They went at him like missiles, fought him through the fence, threatened him, insulted him, and rejected him with all the devastating fury of a hidden and obscure anguish. He was everything they had lost. He was everything they might have been. He was the embodiment of the world they were forever excluded from, the world that, prior to his arrival, they knew only as a dim yearning, a deep and distant hum, and that they now felt acutely, as something resembling pain, grief, fear, and rage -- a terrifying thing, a ravaging thing, a brilliant thing -- no longer an vague longing, no longer a diffuse ache, but a living, writhing, desperate thing. A livid, rabid lament. No wonder Roscoe's presence enraged and terrified them, no wonder they fought and rejected him so rabidly, no wonder they fell in love with him, no wonder he broke their hearts. If their rescue had been an expansion, an escape into an amazing world of peace, plenty and seemingly endless possibility, their encounter with Roscoe was the coming up against the hard place where that world ended and mystery began. If their arrival at the sanctuary was their encounter with the best that this human-dominated world can offer its handful of rescued captives -- a life of care, respect and relative freedom in the confines of a controlled environment -- Roscoe's arrival, his literal landing from the dark sky, his descent into their calm, comfortable, chaperoned lives, was their encounter not with what our world has to offer cripples like them (the consolation, the bandages, the crutches, the special care, the reparations we owe those we've victimized), but with what our world, we, have plundered from them. Days and weeks went by before their rage abated but, when it did, it died down as quickly as it had flared up. Clarence was the first to relent. Ian followed suit, relieved and, if Walter continued with the daily displays of martial prowess a while longer, he did so for the sheer pageantry of it. His anger, too, had vanished into thin air. It's unclear what changed their minds. Maybe it was "battle fatigue", or maybe the intruder's wild presence had become more intriguing than threatening, or perhaps they heard, in the furious music in Roscoe's throat, something they had been trying to utter all of their lives, but had never found the sounds for, or perhaps they simply felt and obeyed an inner imperative to outgrow existing boundaries and to bloom, to become what they may have been. Whatever the reason, one day, when Roscoe flew over the fence and landed teasingly in their yard, as he had done every day since his arrival, they did not chase him off as before. They merely strutted, and postured, and glared their silent threats but they did not charge him. And, when he flew over the next day, bringing the gift of a found flight feather, they rushed to examine it with genuine curiosity and delight and, when he dropped it on the ground, they took turns carrying it in their bills, and examining it with intense absorption, as if trying to reconstruct the whole angel from one lost feather. And, when Roscoe landed in their yard yet again the next day, they almost greeted him. It wasn't long before Clarence, and then Walter, began to join Roscoe on his daily foraging expeditions while Ian watched them from the safety of his yard. And, by mid March, when the great big thaw was more than a yearning in their winter-weary bones, and their lungs filled with the breath of awakening roots, you could see them setting off into the wild country every morning, syncing their posture, their gait, their pace, their cadence, their direction, their gaze, their attention and intention like a school of fish. Those were the happiest days of Clarence's life, those two years before genetics crippled his body, those eight glorious seasons when he could roam the living fields with Roscoe and experience the unparalleled, incomparable feeling of being in precise, perfect and profound harmony with his ancestral world. Through Roscoe, he felt what it was like to be in physical, physiological and spiritual sync with the body and soul of the land. To fit. To belong to a historied place where countless generations of his kin had lived, learned, and passed along the wisdom of their community, culture and species over millennia, stretching the 20 million year old flame of their being straight into Clarence's soul. Roscoe's vision allowed him access to a world that was closed to him at all other times and, in that realm, Clarence blossomed like a cherry orchard, every cell in his being opening its secret joys and sorrows to the warmth of this new sun. And something stirred in him, something that had been dormant, domesticated into perpetual hibernation, something that was not supposed to awaken. Roscoe's presence released in him the ghost of an ancient knowledge, it knocked loose the ancient air bubble trapped in ice, and its millennia-old scent devastated him. It devastated his world. There was no going back to this time-old realm that came rushing into his soul but, now that had tasted its nectar, there was nowhere else in the world he could be. Roscoe had made him alive to things and feelings that had no fulfillment in the world he inhabited. Eventually, Clarence's genetically induced breakdown ended his treks. [Domesticated turkeys have been selectively bred to grow morbidly large, abnormally fast in order to reach "market weight" by the tender age of 4 months when they are slaughtered for human consumption. The excessive body weight leads to heart problems and painful leg issues which eventually cripple the turkeys.] At first, he tried to keep up, he bruised himself trying to keep up. But, soon, his brittle bones, his swollen joints, his weakened heart and laboring lungs forced him to stay behind. The day he could no longer join Roscoe on his foraging walks was the day an essential substance was drawn from him. They set off together in the usual way, Roscoe sprinting ahead, half running half flying, Clarence lumbering behind but, only a short distance into the walk, he stopped and went no further. Roscoe called for him to follow, his assembly calls becoming more and more urgent, more and more insistent, but also more and more distant as the open land stretched its silence between them. Clarence listened intently, craning his neck, scanning the endless fields, but he did not follow. He just stood there, in the beaten yard, folding one crippled leg in the marsupium of his breast-feathers, as if preparing to take the next step. But he did not move. He issued one lost call, one single, solitary lost call, an expression of being more than a request for help, a call sent to no one in particular, and expecting no response. And then he was silent. You could hear only the sound of his labored breath, the hiss of air being drawn in with difficulty, filling burdened lungs, stopping with a hitch at the fullest point, like an astonished gasp, and then finally exiting with a long, deep release. Clarence stood tall and silent in the cold morning air, one leg still folded against his chest, its digits furled in the same question mark that had started his journey, the vapor of his breath swirling and billowing around him like clouds, mixing with the morning mist, adding its substance and silence to the mist, becoming the mist.